Place the fish in a non-stick frying pan, pour over the milk, add the bay leaf, and season with black pepper. Bring the milk gently to the boil, reduce the heat, and poach the fish for 5 minutes. Remove the fish from the pan with a slotted spoon onto a plate and flake into bite size pieces with a fork then set aside. Strain the milk into a jug, discarding the bay leaf. To make the sauce melt the butter in a non-stick saucepan then add flour and cook for 2 mins, stirring with a wooden spoon. Gradually pour in the strained milk, a little at a time and stir continuously to avoid lumps. Simmer the sauce gently, stirring constantly for about 2 minutes until thickened. Add the flaked fish to the sauce and mix gently so that the fish doesn’t break up. To assemble spread half of the fish sauce over the base of an approximately 20cm x 16cm baking dish. Cover with a single layer of lasagne sheets, snapping them to fit, then top with half of the sweetcorn mixture and another layer of lasagne. Repeat the layers, fish sauce, lasagne sheets, then end with a layer of sweetcorn mixture on top. Place in the oven and bake for 35 minutes until the topping is golden. Try using smoked cod in this recipe or add a few prawns and maybe some sautéed leeks. Use any leftover creamed sweetcorn to make a quick Chinese style soup just add chicken stock, diced cooked chicken, soy sauce and thicken with cornflour. Vegetarian Options For a vegetarian version, replace the fish some sautéed leeks, grated cheese and a dollop of Dijon mustard. Freezing and Storage Tips Suitable for freezing once cooked Then defrost in the fridge and reheat until piping hot throughout. 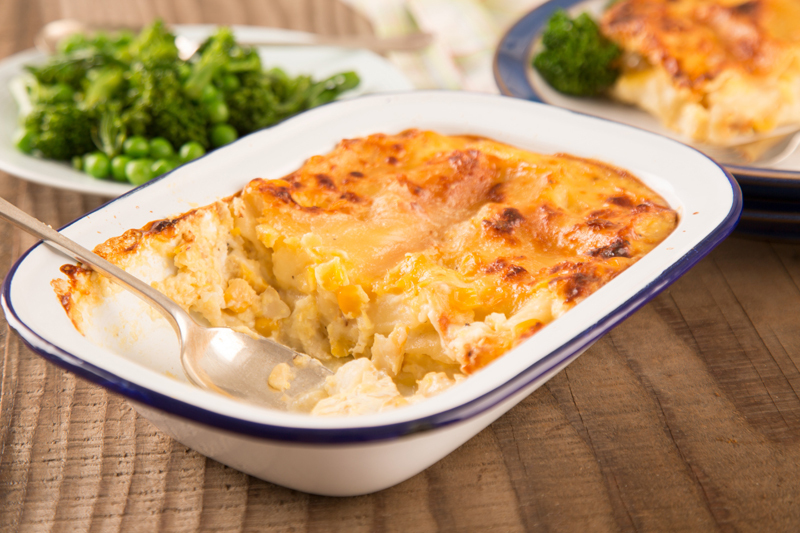 Any leftovers can be stored covered in the fridge for up to 48 hrs and reheated thoroughly until piping hot.